Describes the steps to add a new connection. 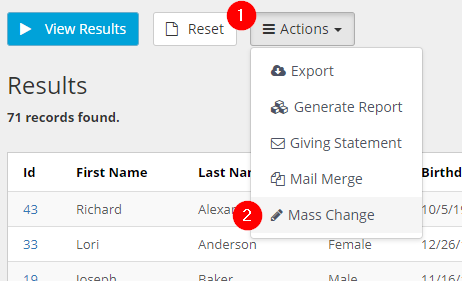 You can add connections either individually for a person or in bulk. You will need the Full Write Connections permission to perform this action. There are multiple ways to add a new connection to the system. The first is to click on the "New" drop down menu at the top of any page, and click on "Connection." The other way is to navigate to the connection listing and click on the "Add New" button at the top. Finally, the last way to add a new connection is directly from the person's profile. Navigate to the person's profile, then click on "Add Connection" from either the actions menu or within the "Involvement > Connections" tab. Date - the date of the connection. This can be a past or future date. It defaults to the current date. Person - the person profile this connection is for. If you are adding a connection from within the person's profile, this field will auto populate for you. Campus - the campus the connection is for. Use this field if the connection was done at one of the church's campuses. 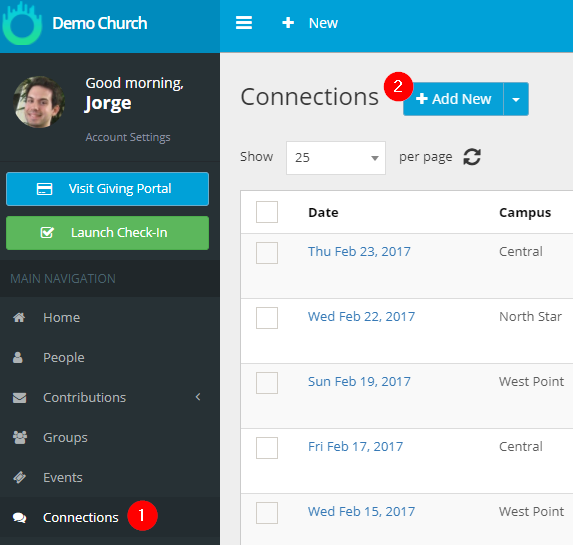 You can add, edit, and delete campuses using the menu to the right of the drop down. You will need the Campuses permission to do so. Type - the type of connection. See this article for more information on managing the list of available types. Important: you will not be able to change the type after you save. Status - the status of the connection. Defaults to Pending. You can click on the menu to the right of the drop down to add, edit, and delete statuses. You will need the Connections Settings permission to do so. This section will contain all custom fields defined on the connection regardless of the type. In other words, any custom fields you add here will appear for all connection types. You can add new custom fields by clicking on the "Add new custom field" button. You can edit or delete a custom field by clicking on the label and selecting "Edit" or "Delete" respectively. You will need the Connections Settings permission to add, edit, or delete custom fields. See the "Fields" section of this article for more information on each field that can be added. You will not be able to add a Ticket/Item or Donation field. If there are custom fields defined on the connection type chosen, then another section will appear with the same name as the type. This section will contain all the custom fields defined. Assignee - optional. This is the person who should follow up with this connection. If set, they will be emailed details of the connection. Due Date - this is the date they must complete the connection by. If the date passes, the connection will be marked as past due. If you always have the same person handling a particular connection type, you can set a default assignee for that type. See the assignment section on this article for more information. You can add and read comments in this section. All previously entered comments will also appear here from newest to oldest. Once you are finished, click on "Save" to add the connection. You will be redirected to the newly created connection. You can check "Keep open and add another" if you are adding multiple connections at once. You will need both the Full Write Connections and Reporting permission to add connections in bulk. Navigate to the People Query Builder and construct a query which returns the people you are interested in adding connections to. 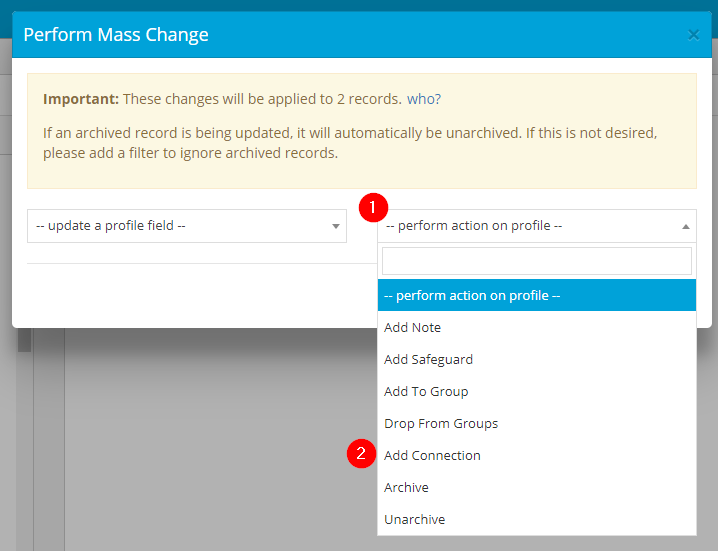 Next, click on "Mass Change" from the "Actions" menu right above the results area. In the pop up that appears, select "Add Connection" from the "perform an action on profile" drop down. A pop up will appear asking you for the details of the connection. This is the same information entered when adding a connection using the single approach above. Enter the required information, and click on "Done." You will be taken back to the "Perform Mass Change" pop up. 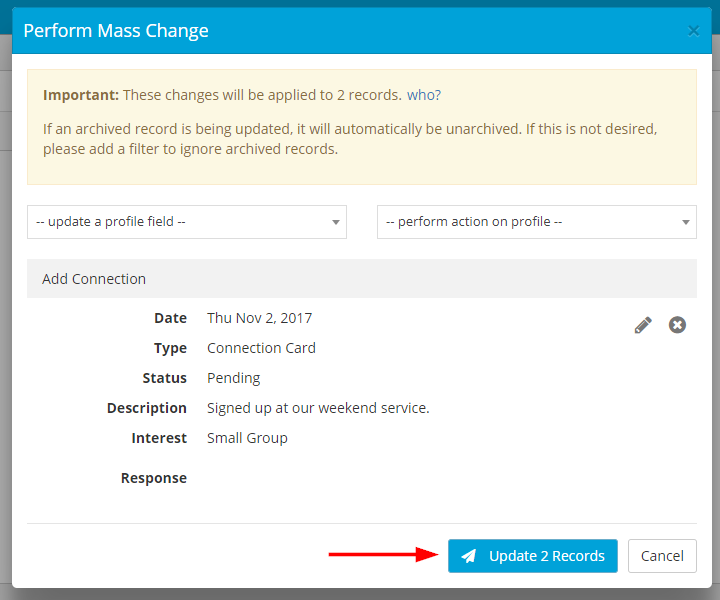 Finally, click on the update button to add the connections to each of the profiles returned in the query.